Padded shorts are an ideal product when engaged in sports like bike riding, skiing, and snowboarding. Friction between the shorts you’re wearing, and your body is one big problem that can ruin your outdoor activity. It usually leads to what we call ‘saddle soreness’ hence the need for a proper padded short. These are not only comfortable when worn but also breathable and elastic. 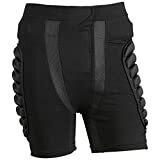 Investing in a good padded short for biking is a must in you want to have a great time outdoors riding, skiing or snowboarding. Our article will take a look at some of the best-padded shorts on the market. Read through and choose padded short that best suits your needs. Decooler is a top choice for the best padded bike shorts when you need the protection of your hip, tailbone, and thigh. The shorts have an ample padding 1.5cm thick to give you enough EVA protective padding. It has an elastic band and a cotton lining to make you feel comfortable. It is also breathable with a close fitting and will not stick to your body. Maintenance is simple, and the short can be washed by hand. Overall, this is a suitable option for skiing, skating, and snowboarding. 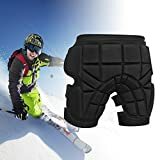 This is a breathable, lightweight and EVA protected padded shorts for snowboarding, skating, sledding, skiing and bicycle riding. The shorts are an affordable option and come designed with a low profile and EVA thickness foam of 0.5inches. They provide a perfect cover for the backside and hips while leaving your muscles with flexibility. The padding construction has been designed to prevent injuries to your hip, sit bone, tailbone, and thighs. IFeng padded shorts have a thick hot-pressed EVA foam which is impact resistant and ideal for preventing injuries to your hip when falling. They are made of a lightweight and breathable material that is comfortable and flexible to wear. The shorts ventilate and will never stick to your skin with a Velcro strap that suits your body size. Always refer to the waist length before you order to take your size. The Kuyou padded shorts are impact resistant with multi EVA pads and pads replacement which are ideal for shock resistance, cushioning and heat insulation. They have a great shape that perfectly fits the body curve and feels comfortable when worn. This is the best way to reduce impact and contact when falling on a hard surface. 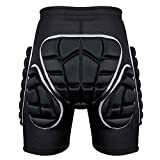 Full protection is given on the lumbar, thing, hip, crotch, and tailbone. The waist of flexible and comes with a Velcro strap that can be adjusted with ease. The Velcro strap also allows for easy wear and takes off. 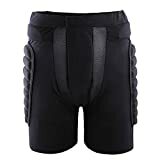 The Seirus men’s bike shorts is another highly rated pick with five removable and breathable pads to make you feel comfortable and protected. This short is exactly what you need for a super protection of your tailbone, hips, and bum when skiing, riding or snowboarding. It has a 4-way stretch Lycra spandex shorts that comfortably fits under the pants. The thick pads will soften any impact on hard grounds protecting you from injuries. It also insulates against snow when sitting on a cold surface. The waistband is comfortable and has a drawcord. Just as the same says, this men’s padded cycling shorts is a bum saver when falling on hard surfaces. It is a quality choice made of soft and breathable mesh. The short is flexible and perfectly fits your body providing high comfort levels. The EVA foam is shock absorbing in the entire region of the tailbone and hip. You can skate with peace of mind knowing your body is protected. The Champro padded shorts are another top quality choice providing users with the ultimate flexibility and protection. 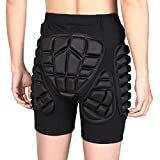 These shorts are the best choice for basketball players who need lot flexibility when running with the ball. They are designed with a DRI-GEAR moisture wicking material to remove any sweat from your body. The shorts are highly compressed and will keep your muscles warm and protected at all times. High compression is what makes them look small despite the thick EVA foam. The Xtextile will protect your vulnerable thigh, hip, and tailbone when skating, skiing or snowboarding with ample padding. These shorts have a thick foam padding 2cm thick to give you maximum protection. The cotton lining makes you feel comfortable as you move around. The material used to make the shorts is breathable and close fitting. It fits your body perfectly and does not hold onto the skin even on sweaty days. The elastic band is strong and easily adjustable. There is a further storage bag for easy carrying. 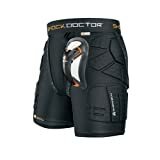 With integrated fabric, the shock doctor is by far one of the best-padded shorts on the market. This padded short uses the X-Fit Brief cup retention system that integrates with the internal mesh for unparalleled support and comfort. The exclusive pattern of the short fits with the anatomical body of humans fitting perfectly without feeling compressed. Users enjoy maximum freedom of movement with ease. It also features the ultra-carbon flex cup which helps transfer shock from vital areas of your body for protection. Your outdoor adventures will feel safe and a lot more enjoyable with padded shorts. Padded shorts are not only comfortable but also protective of the most vulnerable parts of your body. We’ve highlighted some of the best picks on the market for you so go right ahead and buy with confidence.